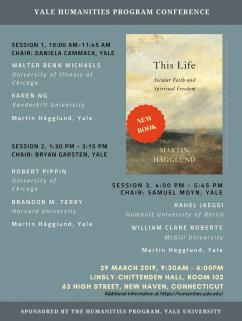 Join us for a discussion of Martin Hagglund’s new book, This Life: Secular Faith and Spiritual Freedom. Ranging from fundamental existential questions to the most pressing social issues of our time, This Life argues that our commitment to freedom and democracy should lead us beyond both religion and capitalism. Leading theorists of society, culture, literature and politics will offer comments on the book, the author will respond, and we’ll have plenty of time for the audience’s participation.